Quality, Strength, Reliability, Performance, and Consistency are words that are synonymous with Binani Cement, the flagship company of the Braj Binani Group. In ‘cement’ matters, these qualities make Binani Cement the preferred choice for engineers, builders, and contractors. Binani Cement forms the foundation of some prestigious projects in India and abroad – Dubai Metro (fully automated rail network), and the state of the art Port Khalifa at Abu Dhabi. General purpose high strength cement, which is widely used in general civil engineering construction work combines with water, sand, and stone to form a durable and strong construction concrete capable of bearing great loads. 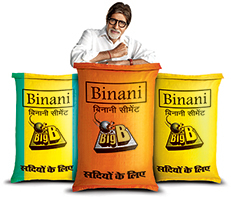 Binani Cement produces OPC cement of two grades — 43 and 53. Environmental friendly and economical PPC cement is valued for its greater resistance to the attack of aggressive waters as compared to normal Portland Cement. This is the preferred choice of cement for building hydraulic structures, mass concreting works, marine structures, masonry mortars, and plastering. GGBS is used to make durable concrete structures in combination with ordinary Portland cement and/or other pozzolanic materials. It is known for its durability, extending the lifespan of buildings from fifty years to a hundred years. Binani Cement has a well-established sales network in India, UAE, UK, Sudan, South Africa, Tanzania, and Namibia. The company due to continuous mounting losses and unable to pay its debt obligation had been referred to NCLT for resolution by its lenders. Under NCLT, the bids are being called off from the potential buyers, and finally, after a tug of war between Dalmia Bharat and Ultratech Cement( Aditya Birla Group Company), the latter won the bid. In Nov 2018, the Ultratech has offered a final bid of Rs 7,950 crore for the asset, Ultratech has gotten the ownership of a 6.25 MT plant in the state of Rajasthan that comprises an integrated cement unit with a capacity of 4.85 MT and a 1.4 MT split grinding unit. Now Binani Cement has become a Subsidiary of Ultratech Cements. I have 507 nos of BINANI CEMENT shares in my DEMAT Account with ICICIdirect.com. Kindly describe procedure of selling after acquisition by M/s Ulratech Nathdwara Cements Ltd.